Like a Dali masterpiece, this image of Messier 8 from the NASA/ESA Hubble Space Telescope is both intensely colourful and distinctly surreal. 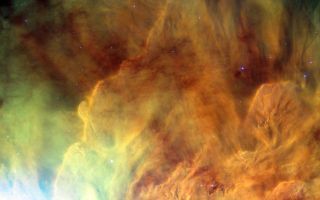 Located in the constellation of Sagittarius (The Archer), this stunning space wallpaper reveals a giant cloud of glowing interstellar gas is a stellar nursery that is also known as the Lagoon Nebula. Although the name definitely suits the beauty of this object, “lagoon” does suggest tranquillity and there is nothing placid about the high-energy radiation causing these intricate clouds to glow. The massive stars hiding within the heart of the nebula give off enormous amounts of ultraviolet radiation, ionising the gas and causing it to shine colourfully, as well as sculpting the surrounding nebula into strange shapes. The result is an object around four to five thousand light-years away which, on a clear night, is faintly visible to the naked eye.